The Best Terrible Review – EVER! 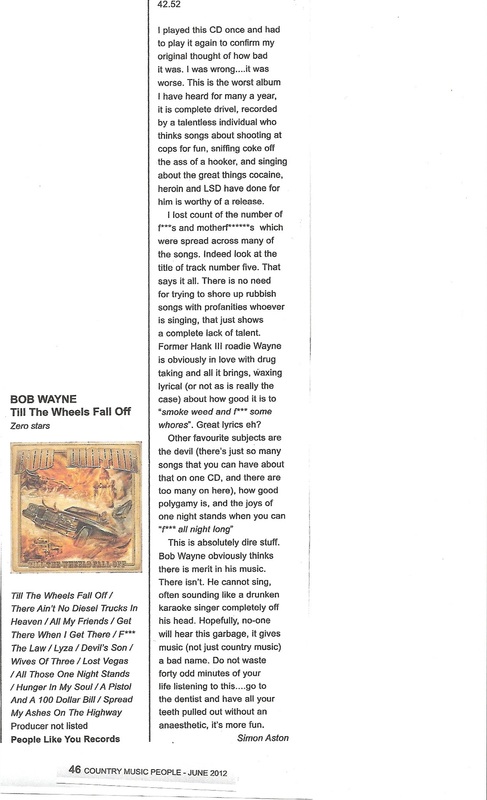 The good folk at Country Music People were kind enough to review Bob Wayne’s new album ‘Till The Wheels Fall Off’, I not sure, but get the impression they weren’t too keen. I don’t know about you, but if I hadn’t already got it I would be rushing out to buy it! This entry was posted in Press Releases and tagged Bob Wayne. Bob Wayne Till The Wheels Fall Off free download, Century Media, Country Music, Outlaw Carnies, People Like You records, Simon Nott., Simon Says PR. Bookmark the permalink.